A coming-of-age family drama about a young woman in wartime Hiroshima, Japan. An animated family drama set in the war-torn Kure City, near Hiroshima, adapted from the manga of the same name by Fumiyo Kouno. 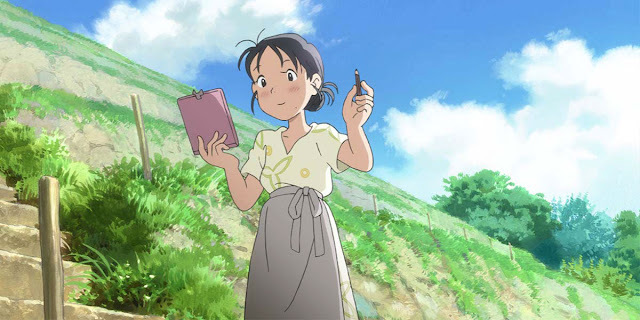 This is a very simple but touching story of a young, carefree, Japanese adolescence girl Suzu (voiced by Rena Nounen) who originally lives in Hiroshima during World War II. She is also a very talented artist who likes to sketch. However, after she turns eighteen, she agrees to merry Shusaku Hojo (voiced by Yoshimasa Hosoya) a naval officer who lives in the nearby port city of Kure. The movie then concentrates on her new life in Kure, as a new wife & daughter-in-law copping with her new family and the approaching horror of war. Being a daughter-in-law, Suzu is expected to take care for her new family by doing all sorts of family chores. The movie also shows how she prepares meals for them, with very little because of food rationing. She has to make the most use of whatever she can find in the garden. She also shows us how to make practical wartime evacuation outfits from re-cutting old kimonos and redesigning them. Overall, she is a very brave and creative Japanese young woman living in wartime Japan who has to make use of very little resources into brightening up their living standard. However, being so artistic, Suzu sees her wartime life from a very different perspective. Through her creative imagination those frequent midair bombings around her family home accordingly become soft splashes of bright colors fireworks. But once she gets into trouble while sketching warships, consequently leading the local Military Police to accuse her of being a spy. Although this is an animated movie, director Sunao Katabuchi and his team put a lot of effort into researching and pay attention in showing the viewers how Hiroshima and Kure would look like during wartime 1945 Japan. Therefore resulting in the beautifully drawn, historical accurate background, landscapes and buildings consequently making the whole movie look authentic. The use of watercolor also helps to make the overall experience very beautiful and refreshing to behold. Moreover, the Japanese are not seen as villains in this movie, they are normal families, civilians and human beings, struggling to live from day to day. Kure is a very beautiful, peaceful port city with rolling green hills, but life is frequently disrupted by air raids, bombings and food shortage. As we become more accustomed to Suzu’s simple, cheerful life, the approach of August 1945 when the inevitable finally lands in Hiroshima near the end of the movie, it nevertheless packs a powerful punch. Interestingly, the animation also changes in style and turns into a much more gritty and serious look. Older viewers will probably get more out of this animated movie than younger ones because of its serious themes regarding arranged marriages, a woman’s role in Japanese culture, war and recession. 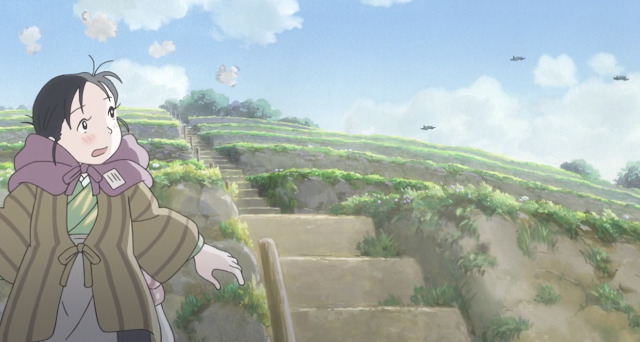 However, "In This Corner of the World" shows us that the human spirit, no matter how defeated or broken, it still manages to get by and move forward. But at a running time of 129 minutes, this movie can do with some trimming to improve the pacing.